Recently I came across a blog on abandoned bridges and stuff on a Google search. From time to time I like to run a Google search on things related to Interstate 275 in the Tampa Bay area to see the results; most of the time I see stuff related to Interstate 275 in the Tampa Bay area which links to Interstate275Florida.com. The blog is called Structural Descent, which is an urban exploration photography of abandoned places and objects done by Richard Rizzo. I haven’t gone through the entire blog yet, but if you are looking for pictures of abandoned places and infrastructure Richard’s blog is a great place to start. Now on to the old Sunshine Skyway Bridge. I was looking at Richard’s photo of the old Sunshine Skyway Bridge which was taken in 1986 using 35 mm slide film at the blog entry. The photo is very superb knowing the fact that digital photography as we know it today has not been introduced yet. In the photo you see the damaged support pier on the southbound span of the old Sunshine Skyway as well as the four main channel piers in the background. Now I would like to give you a backgrounder on the old Sunshine Skyway’s southbound span support piers, in particular the piers that were damaged in the 9 May 1980 accident with the Summit Venture. We’ll first start with the pier that was directly impacted by the Summit Venture. 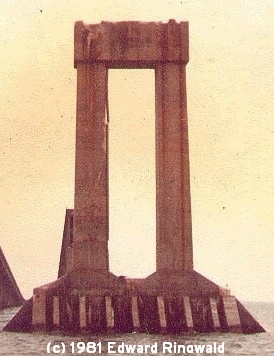 The support pier directly impacted in the 9 May 1980 accident is an anchor pier which holds the south cantilever in place and is a transition from through truss to deck truss. On the two lane roadway it is clearly demarcated by an expansion joint as well as the bridge railing changing from concrete 1954 style railings (after all, the southbound span of the old Sunshine Skyway was based on its 1954 northbound counterpart) to steel railings that are commonly seen on many drawbridges leading to the Pinellas beaches. This pier is called Pier 2-S, which is the second pier south of the main shipping channel. I believe the top of the pier that was damaged in the 1980 accident was sheared off and went into the water intact upon impact. After all, you have a heavy vessel such as the Summit Venture (even though it was empty coming into the Port of Tampa) and that support pier could not withstand the impact when the ship made contact. After all, Pier 2-S was placed out of the way of shipping traffic and I believe it was not designed to withstand a direct hit from ocean going vessels such as the Summit Venture. Right after impact Pier 2-S sank all the way to the bottom of Tampa Bay while at the same time the section of deck truss to the next support pier, Pier 3-S, came crashing into the water and landed with the roadway tilted to the side towards the northbound span. I believe that the top of the pier still rests on the bottom of Tampa Bay where it came to rest after impact even to this day creating a mini-fishing reef. Parts of the deck and through truss landed on the bow of the Summit Venture and the gash that you may have seen in St. Petersburg Times photos on the right hand side of the bow I believe were the result of the impact with Pier 2-S, which set off a chain reaction that ended with 35 people losing their lives on that stormy morning. Now we’ll go over to the main channel pier which is just north of the support pier that held up the majority of the southbound span until the 9 May 1980 accident. That pier is called Pier 1-S, which is the pier immediately on the south side of the shipping channel. This pier was damaged in the 9 May 1980 accident but it remained standing and it would be an icon of the old Sunshine Skyway for years to come until the new Sunshine Skyway was built. There are four main channel piers that held up the old Sunshine Skyway, which for many years performed their duty of supporting a major bridge that carried traffic between St. Petersburg and Bradenton from 1954 to 1987. One has to admire the architecture that went into the design and construction of all four main channel piers of the old Sunshine Skyway, including me. However, Pier 1-S’ architecture was much different than the three other main channel piers which made this pier distinct for many years, even after the 9 May 1980 accident. How did Pier 1-S become so different? We need to go back to 1967, when construction on the old southbound span of the Sunshine Skyway began. The main channel piers on either side of the shipping channel were constructed identically to their 1954 counterparts (in fact, the southbound span was constructed identically to the 1954 northbound span). However, two years later in 1969, workers constructing the southbound span noticed something wrong with the main channel pier that had the potential of delaying the project. It is believed that the pilings that hold up the main channel piers on either side of the shipping channel were made of concrete – the same concrete pilings that you see on most other Tampa Bay area bridges including the Gandy Bridge – and were not driven far enough to reach limestone. By comparison the main channel piers for the 1954 northbound span were made of steel with the endings shaped like the letter H and were indeed driven into the bottom of Tampa Bay until the pilings rested on limestone bedrock. In the case of Pier 1-S on the southbound span, the combination of concrete pilings and inadequate depth is what is believed to cause the serious cracking. So, the Florida DOT spent about $3,000,000 to have the pier repaired in place. Sure the pier could have been replaced completely but that would have been more expensive; besides, the Florida DOT needed that southbound span as soon as possible due to increasingly heavy traffic on the two lane northbound span. Here is what I believe had to be done to repair Pier 1-S in order to open the southbound span of the old Sunshine Skyway for travel. First, steel pilings were driven immediately adjacent to the base of Pier 1-S and then the pilings were encased with concrete, creating the larger base than the other three channel piers. Next, the top of the pier was encased in a rectangular block I believe in order to reset the two large supporting legs that hold up Pier 1-S.
With the repairs made to Pier 1-S, its appearance and architectural look was drastically different than the other three main channel piers, which gave Pier 1-S the signature look on the Sunshine Skyway’s southbound span. The main channel pier on the southbound span immediately north of the main shipping channel, Pier 1-N, was believed to be in pretty good shape. After all, Pier 1-N’s architectural look was identical to the two main channel piers that hold up the northbound span. In the 9 May 1980 accident, it is believed that Pier 1-S was the first pier to be hit by the Summit Venture. Unlike the support pier to the south, Pier 1-S is a main channel pier which could resist impact by ships thanks to its design. Luckily, the Summit Venture was headed into the Port of Tampa with an empty cargo hold; I am not sure how Pier 1-S would have held up if the Summit Venture was carrying a full load. In the months and years following the 9 May 1980 Sunshine Skyway tragedy Pier 1-S became an icon associated with the old Sunshine Skyway Bridge in its own right. It represented more like a statue rather than a bridge support pier which was supposed to carry southbound traffic from St. Petersburg to Bradenton. Right after the 9 May 1980 Sunshine Skyway tragedy the Florida DOT wanted to get the southbound span repaired and back in service. Such repairs I believe would be done using the remnants of the southbound span excluding Pier 1-S and Pier 2-S, which would have been completely replaced. However, things took a turn in another direction – with the blessing of then-Florida Governor Bob Graham - which resulted in the construction of a new Sunshine Skyway Bridge that we Floridians can cherish for the future. Not only the new Sunshine Skyway is a signature icon of the Tampa Bay area, it also heralded the completion of Interstate 275 in the Tampa Bay area which makes 59 miles of driving and commuting pleasure for residents of the Tampa Bay region. Once the new Sunshine Skyway Bridge opened in 1987, Pier 1-S and Pier 1-N – the two main channel piers that held up both the 1954 northbound and 1971 southbound spans of the old Sunshine Skyway – were retired from service. The old Sunshine Skyway was demolished in 1991, including all four channel piers and the damaged Pier 2-S that was damaged in the 9 May 1980 accident. Today all that’s left of the old Sunshine Skyway are fishing piers. Now for an anecdote on the tall channel piers that held up the old Sunshine Skyway. Although the old Sunshine Skyway and its tall channel piers are gone, it is a reminder of the tragedy that took place and the triumph that came several years later when the new Sunshine Skyway opened which is today a signature icon of the Tampa Bay area as a region. After all, we mourn when tragedy strikes and we celebrate when we accomplish triumph. There is already a memorial at the north Sunshine Skyway rest area, but it is not a memorial to the 35 people who gave their lives that fateful morning on 9 May 1980. This memorial is a tribute to a tragedy that took place earlier on 28 January 1980 when the US Coast Guard Cutter Blackthorn collided with the tanker Capricorn in Tampa Bay west of the old Sunshine Skyway. Now here’s an idea for a memorial to the 35 people who tragically lost their lives on that fateful morning of Friday, 9 May 1980: An obelisk-type monument being a scaled down replica of the two main channel piers that held up the southbound main span of the old Sunshine Skyway and a plaque in the center that would have an appropriate inscription. If you haven’t been by the Sunshine Skyway page over at Interstate275Florida.com, feel free to stop by and take a look. I am planning to add more historical photos of the old Sunshine Skyway in the not too distant future, so I need your help! If you happen to have any historical photos of the old Sunshine Skyway Bridge – especially construction on the 1954 and 1971 spans as well as the tragedy on 9 May 1980 and afterward, please let me know by posting a reply or contacting me via the feedback page here at Interstate275Florida.com. If your photo is used I will give you full credit.